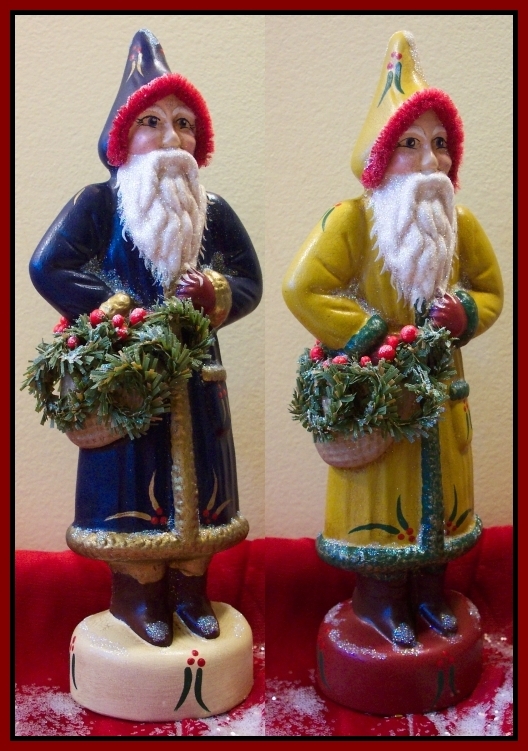 All chalkware figures are fashioned from antique metal chocolate molds some dating back to the 1800's. 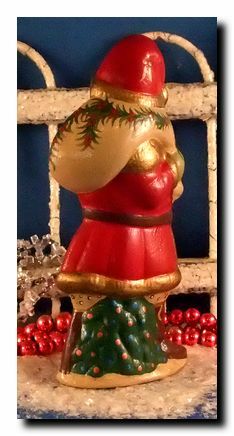 Each collectible is individually hand painted with several coats of fine artist acrylic, aged, then sealed to last for generations to come, true family heirlooms. Each piece is SIGNED, DATED AND NUMBERED. Your collectible arrives in his very own star stamped, aged, gift/storage bag. The top is tied with twine with an added aged name tag. A perfect place to either store your guy during his 'off' season or use as a gift bag....just add your own gift tag! Sweet apples and lots of love is what this Apples Santa has to offer. His kind, pleasant face is very detailed and sports a wonderful long beard. His hands are bold, just right for holding onto his heavy toy bag he has slung over his shoulder. He is wearing a deep burgundy 'velvet looking' robe trimmed with olde gold 'fur'. 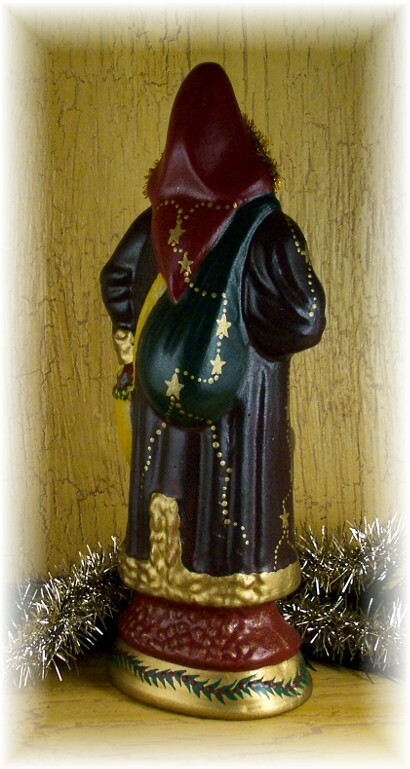 Gold handpainted stars hang from his robe, appearing as though they are attached by 'chains'. This big guy is just perfect all the way around...from head to toe! Don't miss adding this one to your collection. 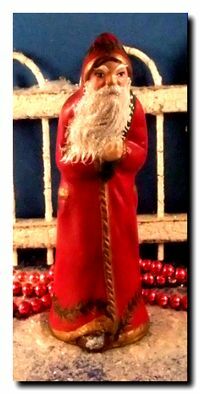 This Father Christmas was fashioned from an antique metal chocolate mold, a turn of the century mold made by mold designer Matfer. This guy's face is so pleasant and kind, sporting the most perfect beard, full and long. He is just pure magic from head to toe! His over-the-shoulder sack is burlap textured and is brimming full of greens and berries. 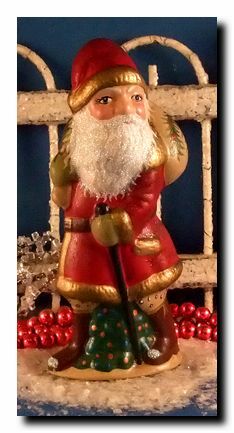 Standing a full 9 inches tall, he will make a wonderful addition to your collection or the perfect gift for that avid Santa collector on your gift giving list. 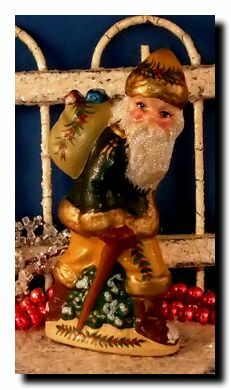 Pere Noel is made from an antique French chocolate mold. He just beams with elegance! He has a wonderful face, happy and kind. His beard is just perfect, nice and full, but not too long or it would cover up his antique gold breast plate. 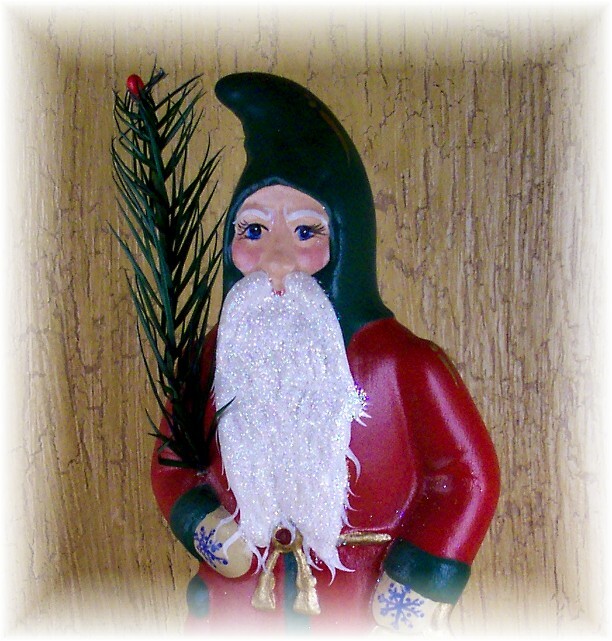 Pere Noel arrives at your home in a handmade, star-stamped aged storage/gift bag. Tied with twine and a name tag attached...this bag makes a great place to keep him safe during his 'off' season or the perfect gift bag. Very fine mica is used here and there to add to his magic. Sealed several times to preserve him for years to come. Sure to become a family heirloom. 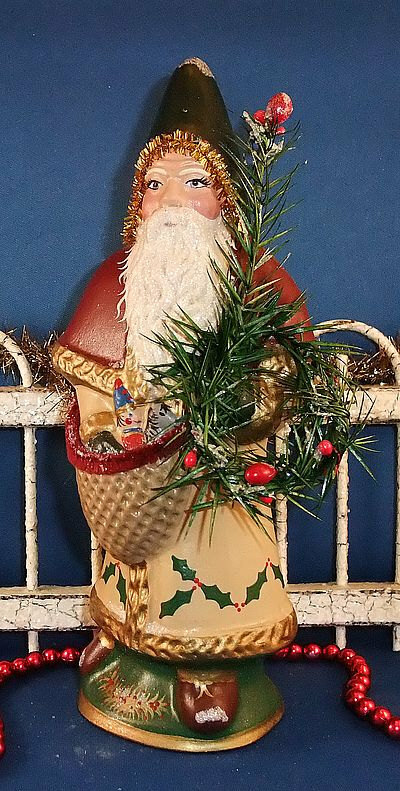 Fashioned from a very early antique chocolate mold, this Santa is a keeper of the night. On evenings before Christmas eve, he goes from house to house peeking in windows checking on each child's behavior. His gold candle lit lantern lights his way through the dark night. Santa has a tired face and eyes, wearing a frown...tired from his long pre-Christmas nights. His beard is long, perfect and flows down past his gold rope tasseled belt. His robe is deep red with a dark green hood and trim. He has on antique white mittens with snowflake accents. His boots are brown with gold tassel trim. 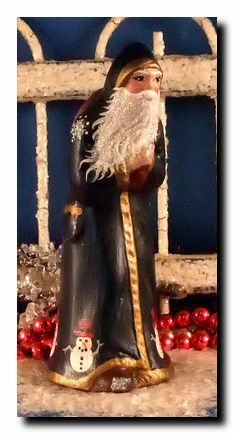 Night Watch Santa is aged with a crackle finish. Very fine antique mica has been added here and there for a magical snowy appearance. 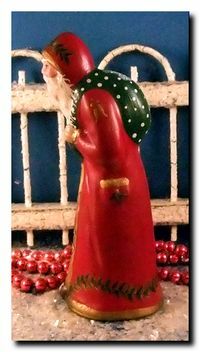 This robust Santa is finely handpainted, aged and crackled, individually handcast from a beautiful vintage chocolate mold made by Heris in Germany. What a wonderful face! He has a wrinkled forehead, twinkling eyes, rosey cheeks, and a tiny little mouth showing through his long, thick beard. So sweet, so pleasant! His large over-the-shoulder toy bag is topped off with a toy soldier sitting on his horse. Holly leaves with berries are painted entirely around the bottom of his long gold trimmed robe. 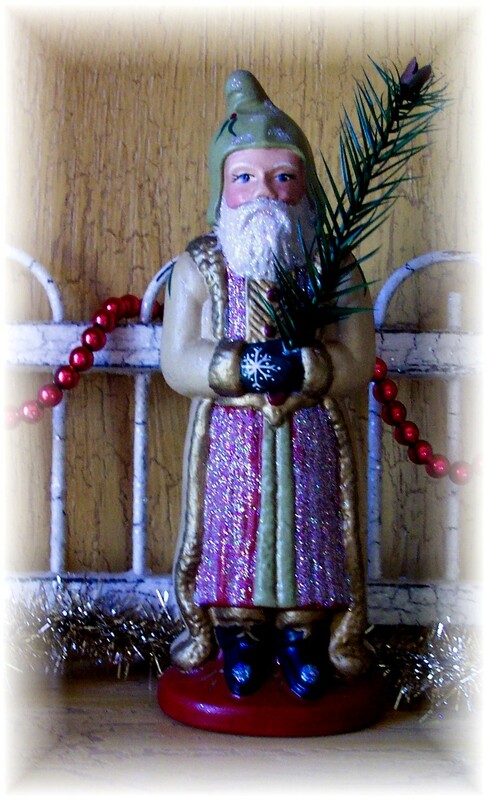 He carries a berry tipped pine branch and wreath made of real goose feathers. A pefect gift for some lucky person on your list...or put yourself on your list and enjoy your new heirloom collectible. 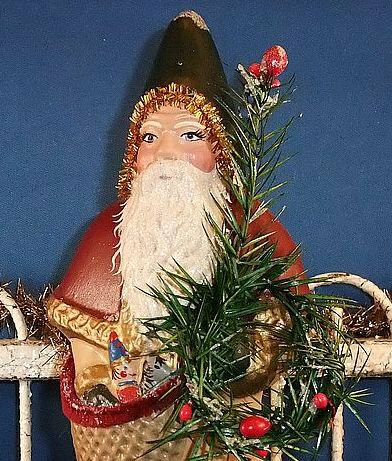 This old fashioned German Father Christmas is just full of personality. I just love the way his head turns looking at your as he trudges along delivering his gifts to one and all. Painted in old colors of deep green and mustard, he looks antique from the beginning. Very fine old mica gives him a winter wonderland appearance. 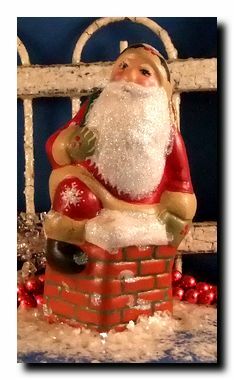 Father Christmas is fashioned from an vintage chocolate mold. One of those rare moments we've caught Santa during his deliveries! 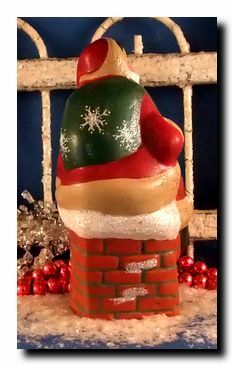 He's sitting atop a brick chimney all laden with snow. He has snowflakes on his toy bag, one stuck on his knee. You can see this is his favorite time of the year! 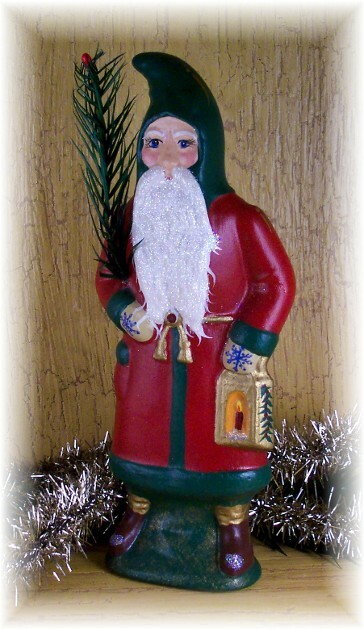 Santa is made from a mold many of us baby boomers have received in chocolate when we were kids! Just a reminder of our days gone by! Father Christmas is bent forward, fighting the snow and wind to get to his destination. The wind is blowing so hard his beard is blown to the side. He is dressed warmly in his long red robe. His robe is trimmed in old gold 'fur' and has an ornate trim of green/gold ivy leaves. His toy bag is green and white polka dots. This wonderful Father Christmas is Snowman friendly! He has decorated his navy robe with snowmen all around the bottom. Snowflakes adorn his robe and toy bag. Santa is on a delivery to some lucky boy or girl. Oh the magic! What a wonderful face, almost child-like, looks like he has a secret! 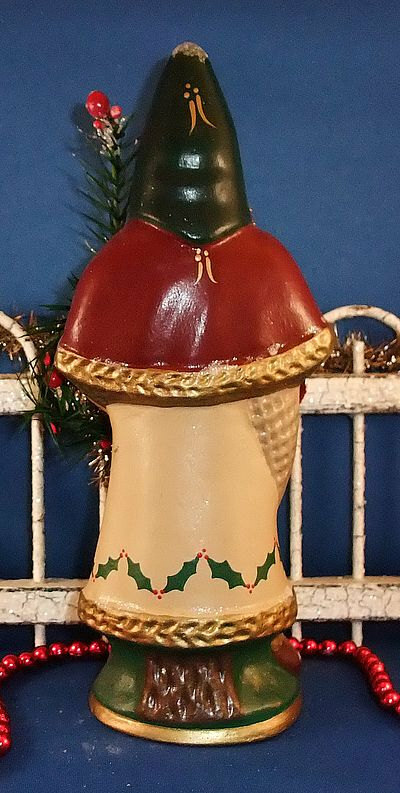 Dressed in traditional red, he does have on his best boots with a special 'ermine' trim at top! He has a walking stick, good thing since there are so many berry laden bushes to hike over. His toy bag is decorated with vines and berries. 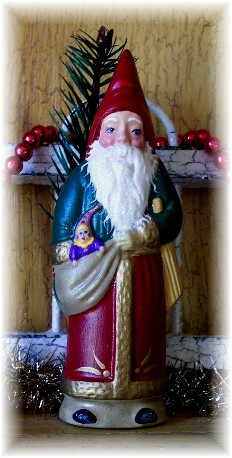 Victorian Father Christmas is just beaming with elegance! A remembrance of a long ago time. His beard and hair are just perfect, long, deep and detailed. His robe has a cape and cap is trimmed in 'gold' fur. 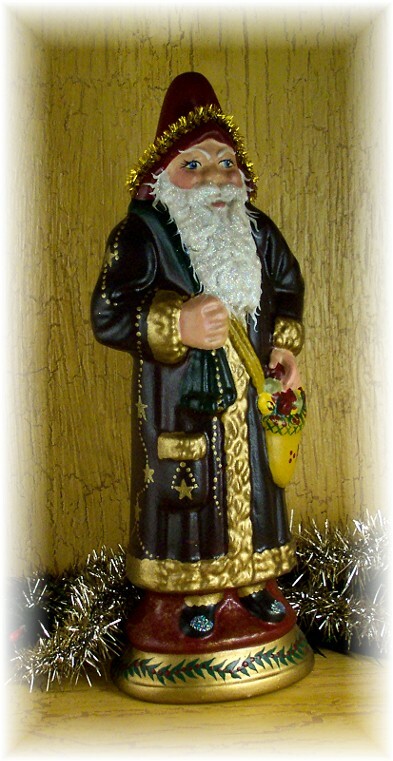 Father Christmas is carrying an over-the-shoulder bag just brimming with apples and oranges. There is much detail to this guy, the more you look, the more you see! This little pine tree is adorned with ball ornaments and little gold rings. 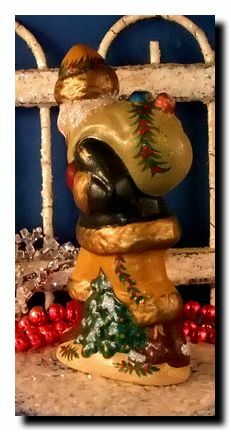 Wonderful old fashioned gold candle holders are holding burning red candles. A little 'snow' has settled here and there on the boughs. A perfect accent in your holiday decorating. 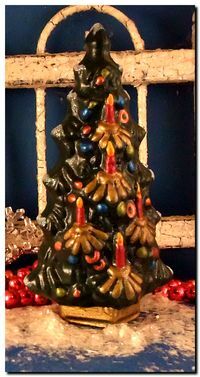 Pair this great little tree up with any one of your favorites. We here at the Stone House love it sitting with the 2010 Limited Edition....the perfect companions! Isn't this little guy just the best? His over-the-shoulder bag looks woven and is over-flowing with green pine stems and red holly berries. This wee guy has a round and plump face...wonderful chubby cheeks and a thick, full beard! 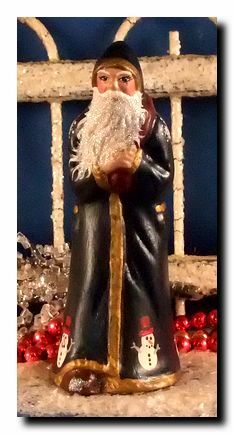 He will make the perfect addition to your Santa collection....and don't forget that Santa collector on your shopping list. Don't forget to choose your favorite color using the pull down menu. What a sweet little Santa.... HAPPY FUN & MAGICAL! His face is so chubby, his chin makes a bump in his wonderful full beard. A lucky child's gift, a Jester doll, is just sticking out of the top of his over-the-shoulder bag. This Santa is just magical. Santa has his toy bag all packed with soon to be childhood treasures. A boat and a doll are laying on top and a toy horse is hanging in the front. He wears a wonderful gown all trimmed in gold 'fur' and is gown is peaking out of the robe in front. Isn't this wee little guy sweet? He'd be just perfect to add a few to grouping on your table or mantel. 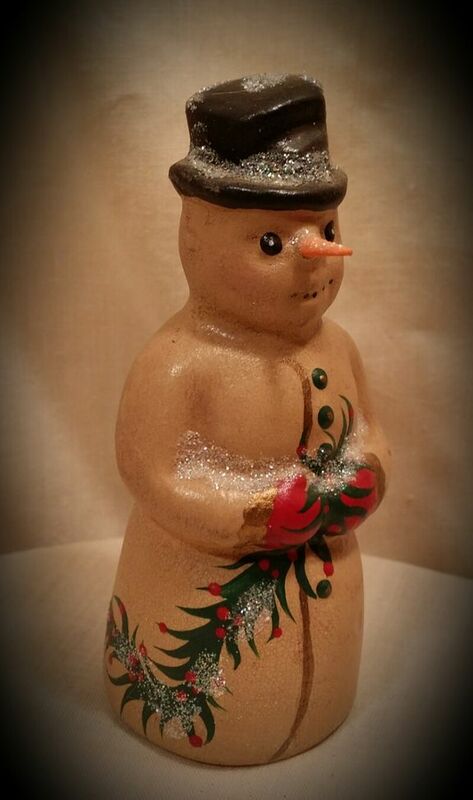 This cute little snowman is painted antique white and aged so he looks like he's been around for generations. An evergreen with berries wraps around his rotund little body.